To say I dislike Microsoft PowerPoint is an epic understatement. At the end of this article, you’ll find a few URLs that explain, in detail, why PowerPoint is a blight on humanity. But I come not to bury PowerPoint, but to praise Comic Life Magiq. Mostly. The name, for example, is supposed to make a typographical connection to the company name, Plasq, which is supposed to sound something like “plastic.” So “magiq” is supposed to sound like “magic.” This is an interesting idea, but it is murder when trying to verbally explain the name of the software, or the company. is a great way to take a bunch of photographs or other illustrations and tell a story. Comic Life Magiq is, too, but the interface has been drastically redesigned (see Figure 1). 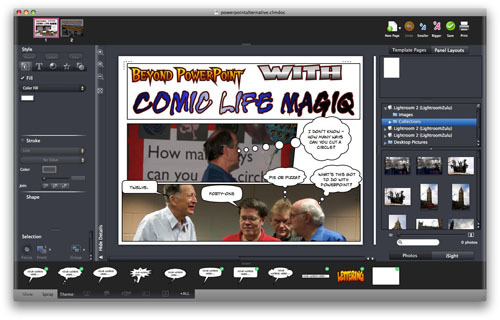 Whereas Comic Life has ready access to your iPhoto library, Comic Life Magiq can peek into your Aperture and LightRoom libraries, too, as well as any folder of images you might select. This can slow things down, especially if you have huge image libraries. On the other hand, you can freely grab anything that shows up in the media browser and pull it into your comic. Cool. Figure 1. The conversation over lunch at a recent General Meeting looks much more interesting when it is presented using Comic Life Magiq. Also added are a number of tools for controlling the thickness and color of lines, the focus of a panel (a great way to ignore everything on a page except the current section you’re working on), the arrangement of elements front to back, and a host of other tools. These include a nice spray-gun for spraying graphics (hearts, balloons, rain, bubbles, spiders) over your comic. There are pre-defined templates (with accompanying artwork) for birthdays, photo books, birth announcements, dog- and cat-centered comics, kid comics, camping and gardening comics, a day at the beach, snow trips and road trips. You can also create your own templates. A vast collection of panel styles is included, from newspaper comics to graphic novels to manga (a highly popular Japanese comic artform). Every panel style can be modified by moving and reshaping the panel elements; there are no real limits. Completed projects can be exported as a series of images, one image per page, for sending via E-mail, posting on Flickr, posting as Web pages, sending to iWeb, or saving as PDF, TIFF, GIF, JPEG or PNG files. Sending a comic through E-mail, for example, will automatically size the comic for Apple’s Mail or Microsoft Entourage, allowing the recipient to view the message in their E-mail client; no special software is required. 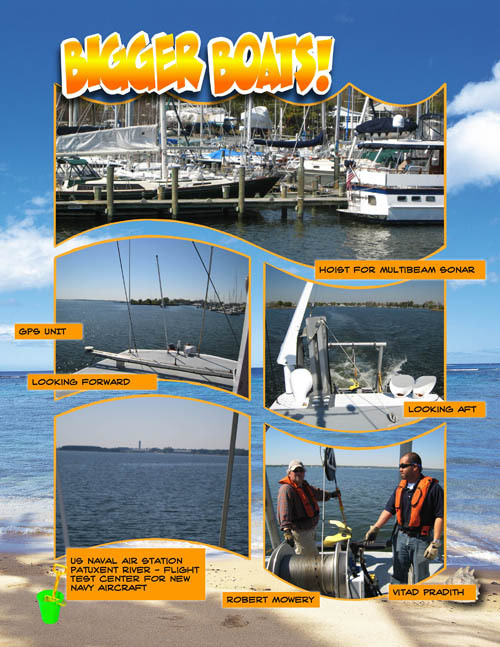 In typical fashion, without looking at any of the help files, I grabbed a collection of photos of a trip to an oceanographic survey vessel, brought them into Comic Life Magiq, and added labels, thought and speech bubbles, and other highlights. Using a cartoon metaphor, it was easy to add explanations of the photos and present everything in a much less formal, much less rigid format than, say, PowerPoint. Page 2 of the eventual nine-page “comic book” is shown as Figure 2. Figure 2. One page from a nine-page comic written to report on a visit to an oceanographic survey vessel. The entire comic book, Revenge of the Bay Hydrographer, is available on the Pi Web site. Initial versions of Comic Life Magiq were, shall we say, a bit slow and prone to crashing. The current version (1.0.2.1 at this writing) is far faster and very stable, though I wouldn’t recommend it for any machine slower than a G5. It will work on a laptop, but a larger screen works best. Fortunately, Pasq offers a free trial download, so you can test it (or the less demanding Comic Life) before spending money. The big question, however, is: why comics? The answer: people read them. If I send my colleagues a set of PowerPoint slides (not that I would, of course; I have standards), there is an excellent chance nobody will look at them. But send them a comic and everybody takes a look. I was recently asked to create a “process flow diagram for optimizing interaction between [my employer] and the public.” The task name alone is enough to put you to sleep. The group that asked for this is expecting a set of slides. Hah! Are they ever going to be surprised! But I bet they read it.